Alice Pheasey and Kenneth McLean on their wedding day. There are many stories that reside in the papers and photographs our forebears set aside to keep. These stories sometimes lack a key, but here is one that, thanks to a loving sister, retains its general outline. Kenneth Angus McLean was born in 1873 in a farmhouse on Cape Breton, Nova Scotia, the youngest of nine children. As a young man, Kenny left the family farm to join his older sister Christine in Boston, where he would have a wider choice of occupations. He didn’t last long in the confines of the city. Kenny, like so many others, decided to seek his fortune out west. He took out a $1,000 life insurance policy, named his sister as beneficiary, and got on a westbound train. Eventually, Kenny landed in Telluride, Colorado. This current-day celebrity ski and film town sits in a beautiful box canyon in the San Juan Mountains of Colorado’s southwest. From 1898 to 1900, Kenny McLean earned a living as a miner in the mountains above the town. 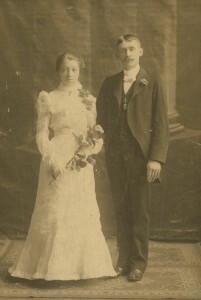 In 1901, Kenny and Fred’s sister Alice were married. Kenny was 28; Alice was 20. Their daughter Thelma Jane was a born a year later. Letters from Alice to her sister-in-law Christine in Boston described life in Telluride: stories of divisive mining strikes and catastrophic avalanches, how precocious Thelma was “such a Papa’s girl,” and news of another baby on the way. (Frederick Nicholas McLean arrived in 1904.) This second pregnancy was very hard on Alice, who was eventually diagnosed with Bright’s disease, a kidney ailment now known as chronic nephritis. The disease caused hypertension and edema, and was beginning to affect Alice’s eyesight. Alice’s letters also mentioned stomach trouble Kenny had been having off and on; she attributed it to the disruption of his being assigned to the overnight shift. 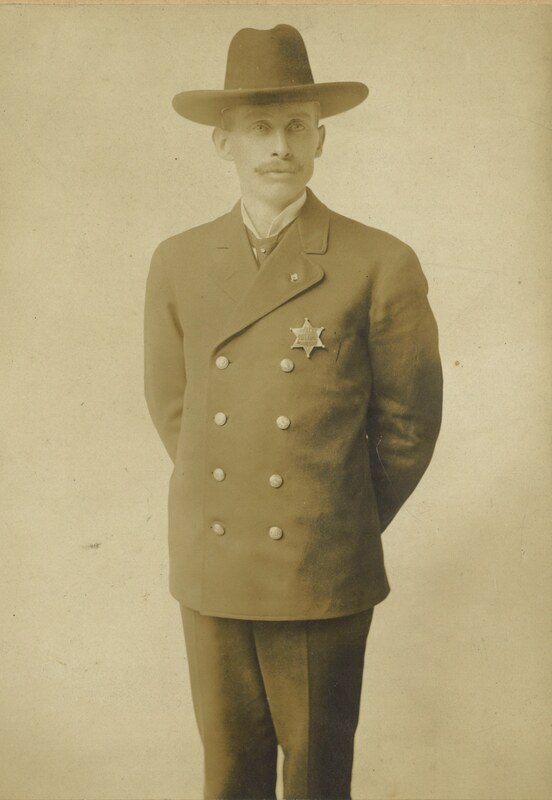 All the while, Kenny was advancing quickly through the ranks of Telluride’s police force, happily moving from night marshal to city marshal, a day job. 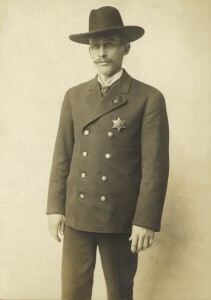 When he was elected Chief of Police in early 1905, he sent Christine two photographs taken to commemorate his achievement. In his letter he told her to “take the one you like best.” Christine must have been very proud of her little brother: she kept them both. On 5 October 1905, the local paper ran a story about a surprise party that Kenny threw for Alice’s twenty-fourth birthday. No one could have guessed that, two weeks later, Kenny McLean would be dead. On 18 October, Kenny arrived home from work, telling Alice that when he had dismounted from his horse earlier in the day, he might have “broke something inwardly.” He asked Alice to “fix the lounge by the stove” and summon the doctor. By the next afternoon, it was evident that Kenny was not going to recover. Although he was in excruciating pain, he remained conscious till the end, shaking hands with close friends who came to say good-bye and kissing Alice right before he died. Kenny was thirty-three years old. When his obituary appeared the next week, Alice cut it out and mailed it to Christine with a penciled note at the bottom: “Will write when I am more able.” An autopsy revealed that Kenny died of a perforated gastric ulcer and acute peritonitis. A few weeks later, Christine received a tear-stained letter from Alice detailing the events leading up to Kenny’s death. In subsequent letters, Alice wrote of her struggles to do the washing and other household chores in her weakened state and worried that she would not be able to care for the children if the Bright’s disease continued to erode her vision. Alice’s mother had died and Fred Pheasey had moved his family to Alaska; Alice was alone in Telluride. Christine had never married, so had only to ask her sympathetic employer for leave so she could go to Alice. By the time Christine arrived, Alice’s health had deteriorated further. In April 1906, Alice McLean passed away at the age of 25, leaving three-and-a half-year-old Thelma and 18-month-old Freddy orphaned. The local paper lamented, “it seemed as if the light of her life went out with his.” Perhaps Alice died of a broken heart. She asked Christine to raise her children and that she be buried in her wedding gown. Thelma and Freddy McLean at Revere Beach. Christine McLean was a strong, intelligent woman in her late 40s. She worked as a seamstress for a wealthy family who lived on Mount Vernon Street in Boston. Christine seemed unafraid of taking on the rearing of two children alone. She paid for a gravestone to be placed in Lone Tree Cemetery (it never appeared), packed up Thelma and Freddy’s belongings, and boarded a train back east. Soon Thelma and Freddy would begin a new, very different life in the servants’ quarters of a mansion on Beacon Hill. 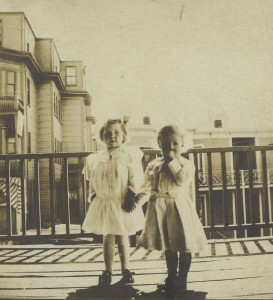 The first photo of the children in their new home shows them sitting on a step together on 4 July 1906, Thelma holding a small American flag. Christine knew that the children would benefit from any connection they could have to their parents. In addition to their clothing and favorite toys and books, she made a point of bringing a few pieces of the family’s china and glassware, jewelry, photos, and personal mementos with her from Telluride. Among the items were Alice’s calling cards, still in their engraved case, and a book in which Alice and Kenny recorded family births and deaths. Most importantly, Christine lovingly preserved the letters she received from her brother and his wife so the children could read them and hear their parents’ voices once again. It is because of Christine McLean’s foresight that I am able to tell the story of Kenny and Alice McLean, my great-grandparents. Thelma and Fred’s Aunt Christine raised them with religion and high expectations. The religion stuck with my grandmother Thelma, but not so much with my great-uncle Fred, who was a bit of a rabble-rouser. 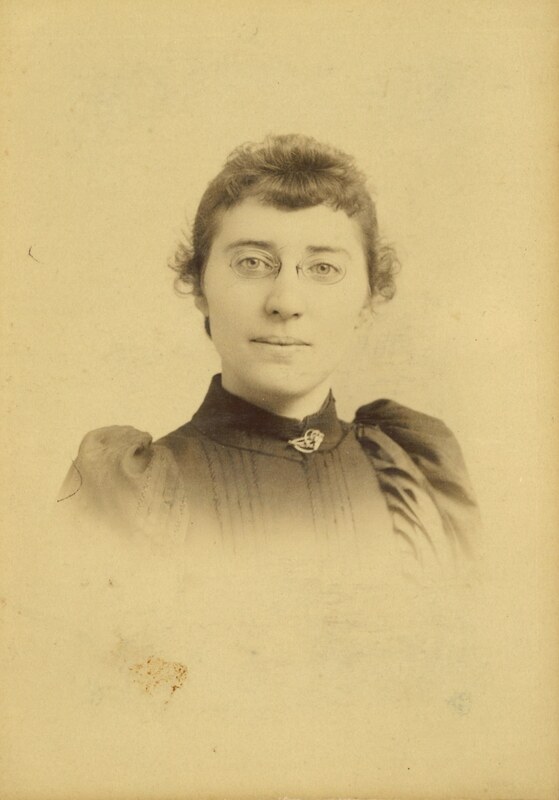 Thelma went on to have four children of her own. Fred, who couldn’t swim, sailed the world on export liners and cruise ships, rising to the rank of Captain. He married four times to three women, but never became a father. Instead, he doted on his nephew and three nieces. I believe Thelma and Fred thought of their parents every day of their lives. My grandmother once told me that she never feared death because she knew it meant she would be reunited with her parents at long last. I am amazed at the resemblance between the author and Christine, as well as the story. thanks for sharing it. I never thought about it before, Judith, but now I see it! Visiting Nova Scotia 15 years ago, we went to MacLean’s Restaurant and the owner was a modern-day version of my great-grandfather Kenny. Same deep-set eyes and long face. That was a nice story! I also have MacLeans from Nova Scotia. Later on we used Mac rather than the Mc. My ancestor is Neil and his land was in L’Ardoise (take a right after you get off the causeway). Where is your family, Bud? Actually, they were from Crowlista (Cradhlastadh), Uig, Isle of Lewis and ended up in Little Narrows, Victoria County, NS. So “technically’ they weren’t from Nova Scotia. I do have a Neil MacLean, s/o Hector and Christy Matheson, but he is not blood related. I have Acadian ancestry from Isle Madame, not too far away. Great story with a positive ending.Such a treasure the letters are. I have letters written by my GG Grandfather from the Gold Rush time in San Francisco so I know the value of keeping family items. Great story. Though from the east I now live in the area of Telluride and see many similar stories. Life was difficult In these mining towns . My family kept things too. Reading through the old letters adds so much to making people more than names and dates in the family chart. What a heartwarming and moving story! Thank you for sharing. Yes, it was the Sears family at 85 Mt Vernon. What a heartwarming ending to the tragic story of Kenny and Alice’s brief lives together. And I hope we’ll read many more Vita Brevis stories from you in your work at the Society. Welcome! I really loved your story! Thank you so much for sharing. Debbie, I don’t know the name of the saloon Kenny owned with his brother-in-law, but Kenny is the lawman leaning against the bar in this well known photo of the Cosmopolitan Saloon in Telluride: http://telluridemuseum.org/shop/index.php?l=product_detail&p=1352. Have you ever looked at the online archive of Colorado newspapers: https://www.coloradohistoricnewspapers.org? I found the story of Kenny’s party for Alice there, among others, by searching Telluride Journal for his name. Check it out. Thanks for sharing such a lovely story — we should all be so lucky to have an ancestor with the foresight of Christine McLean. Thanks for a wonderful story that helped me imagine my ancestors who were in the same places at about the same times. This is what makes a Family History come to light and one most valuable in the telling for future generations not to mention how much it means to you, Sharon Inglis. Thank You Sharon for sharing it! Great tale of amazing folks Sharon – well done!!! Thanks for sharing your very interesting story. For an account of life at a mine above Telluride and other mines in the early 1900’s, see the book Tomboy Bride by Harriet Fish Backus, published in 1969. Harriet Fish married mining engineer George Backus and promptly joined him at a mining camp high above Telluride. Her description of life there, including the hardships and challenges, is fascinating. Also, for the thrill of a lifetime, take a jeep tour from Ouray to Telluride over Black Bear Pass. The mountains are spectacular! You won’t forget it! Thanks for the book suggestion, Carolyn. I will definitely find it. There is a somewhat embarrassing story from the Telluride Journal in March 1902 that tells of Kenny on the trail between the Tomboy and the Smuggler and his gun accidentally going off and killing his horse. Must have been a tough walk back to town carrying his saddle! Great article, and I love hearing the retelling in your unique voice. You and NEGHS are a Greatg match. This was a wonderful article – you really brought these people to life. Thanks for sharing and for the link to the Colorado newspapers archive.